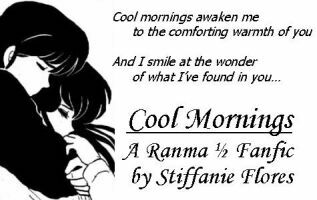 "Cool Mornings" won second place at the Ranma Fanfiction awards. Thanks for voting! Picture is taken from "Maison Ikkoku"
Disclaimer: Ranma 1/2 and all its characters belong to Rumiko Takahashi. Early morning sunlight seeped through the curtains, bathing the room in a warm, golden glow. Outside the window, the lightly blowing wind sent fallen leaves scurrying in the wind. The door creaked open, and a woman appeared in the doorway, still wearing her pajamas. Easing the door open gently, she came into the room, carefully balancing a tray of covered plates. Her shoulder-length hair was swept off her forehead, tied back with a blue ribbon, and a soft smile touched her lips as she approached the sleeping figure lying tangled among the sheets. Laying down the tray on a small table, she sat down on the bed. It shifted slightly under her weight, but the man continued to sleep peacefully. In sleep, the lines of his face softened, making him look endearingly boyish. There was an expression of utter peace on his face, and his lips were quirked up in a small smile. She wondered briefly if he was dreaming about her. Under these circumstances, it wasn't hard for her to believe that. A tender smile spread across her face as she brushed the hair at his forehead. At her touch, he stirred softly in his sleep. "Wake up, sleeping beauty," she said cheerfully. Slowly, languorously, he opened his eyes. He smiled sleepily. "What are you doing up so early? Come back to bed." "Good morning," she replied, ignoring him. "It's a beautiful day." He groaned and buried his face in his pillow. "Yeah," came the muffled reply. "And I'm gonna spend it right here." "Look, you." She pulled on his arm. "I brought you breakfast in bed. So you'd better get up now." She crossed her arms. "Or else." He cracked an eye open and looked at her. He surveyed the scowl on her face, arms crossed over her "Kiss the Cook" apron tied around her waist. "I must be dreaming," he deadpanned. Her eyes narrowed. "Say one rude word about my cooking and you won't get a crumb," she warned. "I wouldn't dare," he replied obligingly, finally pulling himself up on his elbows. "And to what do I owe this honor?" Sensing victory, she lowered her arms and flashed him a sweet, angelic smile. "Nothing." Comprehension dawned. He started to edge away from her. "Okay, spill it out. What do you want from me?" She leaned closer to him. "Well, there's a new movie I want to see tonight..."
He rolled his eyes and pretended to think about it. "With the kind of movies you like, I'd probably be bored to tears within minutes." "Why, you." She stood up and threw a pillow in his face. "Can't you do this little thing for me? What did I marry you for?" He grinned, his eyes twinkling with mischief. "'Cause I can cook and you can't?" She tried to be angry, but ended up laughing. "Jerk," she replied cheerfully. "Tomboy," he replied. He tipped his head and smiled. "It seems so long ago. Before, whenever I'd tease you about not being able to cook..."
"You'd be dead. Or worse." She smiled softly. "Yeah. And here we are now, happily married." She turned and stared out the window. They'd been through so much before they could finally be together. She couldn't help thinking that another couple, less in love, might not have made it against those odds. And she thought of all those times, when things had looked so bleak and hopeless, and she had been on the verge of giving up... and would have missed a wonderful life with a man she loved more than life. Without turning, she said, "I love you." He smiled, coming up behind her. "Why?" he asked, intending the question as a joke. "Because," she said, her voice oddly hoarse, "I wake up every morning and I look at you, and I know that I am loved. Incredibly, completely, unconditionally loved." He smiled at that, but his hand trembled as he reverently smoothed a strand of hair off her cheek. "Because you accept me for all I am, faults and all. Because you love *me*, when you could have had..."
He laid a finger against her lips. "Don't you start on me again," he warned. "But it's true," she insisted. "When I think of how close I came to losing you, that one time, all because I was afraid to tell you how I felt, because I thought it was too late... I *did* lose you," she remembered. "And you didn't come back to me, and I thought..."
He sobered, too, remembering the emptiness in his heart, the day he'd left her. "I thought you didn't love me." "So did I," she whispered. "There was only you," he promised, putting his arms around her. "No matter where I was, or who I was with, there was ever only you." She smiled at that, but her lower lip trembled, and a tear slid silently down her cheek. "We've been through some rough times, you and I," he said, cupping her face and brushing the tear away with his thumb. "Some people said we wouldn't make it, but we're here now, aren't we?" She turned her face into his palm and kissed it. "Because you loved me." He smiled and rubbed his thumb gently against the smoothness of her cheek. "You love me, too." And then the moment passed, and she drew back and brushed at her eyes with her fingers. "Aren't we feeling sentimental today?" he teased lightly. A secretive smile played across her features. "A little." Her eyes fell on the tray beside the bed, and she glanced at him. "We forgot breakfast." "Screw breakfast." He reached for her again. "Come here." She slapped his hand away. "Stop that," she said laughingly. "I'm hungry." "For food!" she exclaimed, and they both laughed at that. She started to pick up the tray, but he put his hand on her shoulder, halting her. He padded over to the small TV table, and lifted it easily along with the tray, and set it down in front of the bed, where they both sat, side by side. They ate in companionable silence for a few minutes. Once, he tried to put his arm around her, but she laughingly pushed him away. She was like that, he thought. She wasn't like most women, ready to succumb at a soft caress or a few platitudes. She was confidence and strength and beauty. And when she desired it, she was sweet and loving, and her smile warmed him like sunshine. She stood up suddenly, and he tipped his head back, looking at her. "What are you doing?" "I'm finished." She walked to the window and drew back the curtains, throwing sunlight into the room. He started to get up. "I have something for you." She picked up her teacup and nodded to the small bedside table, and he followed her gaze, his eyes spying a medium sized envelope propped up beside a table lamp. He glanced at her curiously, and she lowered her eyes demurely as she sipped her tea. a love that's come to mean all that is good and beautiful in my life. He opened the card and read the words inside. the one and only you. His eyes flew to her face. "Papa?" he whispered, his eyes wide. She lifted her gaze to his, her face filled with wonder and awe. And she smiled. "Oh god." The card slid from his fingers, and he yanked her into his arms. "Oh my god." Her eyes brimmed with happy tears, as she kissed his taut jaw. "That's how I felt, too." Her husband turned her in his arms, and there was a smile in his voice. "Do you know how I feel about you?" he asked tenderly. "You make me so damned happy. I didn't know it was possible to feel this much happiness, until I met you." She turned around and stared out the window, a smile on her lips. "Do you know what today is?" "Uhh..." He frowned slightly, remembering something in the card. "Is today that day already?" he wondered aloud. He looked down at her, confused. "Our wedding anniversary." She shook her head. "No." A soft smile touched her lips. "One year ago today, you came back to me." And then he remembered. Remembered that moment when, as he'd met her gaze, he saw the same love he felt shining back at him. "*You* came back to *me*," he whispered. He smiled into her hair. "I didn't know you remembered this day." "I will, too," he promised. "Now that I know." He laid his hand gingerly on top of her stomach, his heart feeling giddy at the thought of their child sleeping within her. "Thank you for my son," he said softly. She smiled at that. "How do you know it's going to be a boy?" "Because," he said reverently, "this is the only dream I have left. Because you've made all my other dreams come true, just by being you." "Now who's being sentimental?" she teased. "It's allowed. My wife just told me she's having my baby." His arms tightened around her. "Come to bed, wife." "You're going to be late." "No, it isn't. It's Monday." "Oh really?" He still didn't let go of her. "Imagine that." "You should get ready to leave. You have a meeting this morning." "Ain't gonna. I'm exactly at the place I want to be at this moment. The only place I want to be." She laughed and untangled herself from his arms. "Well, I'm flattered, but you know what it's like. Places to go, people to meet." He sighed resignedly and flopped down on the bed. "You haven't changed. You still brush me off whenever I try to say something sweet to you." "I'm not like most women," she reminded him. "I don't always need to hear platitudes of love. All I need to know is that you love me, and I love you." She leaned down and pressed a kiss on his cheek. "And you do, and you make me happier than I'd ever dreamed I would be." He smiled at that. "Alright. But just let me lie here for a few more minutes." "Five minutes, and that's it," she warned, getting up. "I'll run a bath for you." A smile quirked his lips. "Only if you'll join me in it." "Pervert," she called over her shoulder, but he could tell she was laughing. And then she was gone. As he lay on his back, he tried to imagine what life would have been without her. But it was impossible. She was an ingrained part of his life, from the first moment he'd laid eyes on her. He remembered her the day they first met, her eyes sparkling with temper and ire, as she yelled at him while he turned his back on her. He remembered the aching devastation in his heart as he watched her walk away from him, thinking he'd lost her forever. Most of all, he remembered the way she'd looked on their wedding day, her eyes shining with the promise of a future filled with laughter and love. She came back into the room, holding a large fluffy towel. Turning her back to him, she opened the closet and riffled through the hangers. Wordlessly, he got up and slid his arm around her from behind, holding her tightly against him. She was his friend and his lover and his wife. She cheered for his triumphs, supported him when he was right, and stubbornly opposed him when he was wrong. With her, every day of his life was filled with purpose and meaning and laughter and love. And now, he thought, his fingers splaying over her flat stomach, she was giving him the most precious gift of all. His dream of a perfect life was coming true. What was that word again? Oh yeah. Contentment. He closed his eyes and smiled. Certain passages in this story were inspired by the books "Paradise" and "Perfect" by Judith McNaught, my favorite romance-novels author. I'd actually written this piece a long time ago, about the same time as I wrote "The Long Goodbye". I was trying to create a picture of perfect, married bliss, but I'd never felt really *okay* with it. Still don't, until now, even. This is definitely in "draft" mode. I got some emails from a few readers asking for a sequel for "The Long Goodbye". I still don't feel inclined on following that thread, because I still maintain that it will definitely ruin the mood and mindset of the story that we tried so hard to achieve. I didn't intend this as a sequel for TLG in mind... I wrote it because I felt like writing, and this was what I got. And so do you. ^_^ But in some ways, I guess you can think of it as sort of a "proposed" future for TLG. Any and all C&C are welcome. Let me know what you think!